7 He [Pharaoh] took six hundred of the best chariots, along with all the other chariots of Egypt, with officers over all of them. 8 The Lord hardened the heart of Pharaoh king of Egypt, so that he pursued the Israelites, who were marching out boldly. Strong sunlight lights this scene. 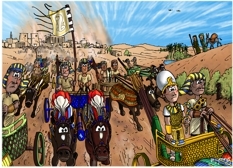 Pharaoh (in the dome-like head dress), in the bottom right of the scene, with many other Egyptian soldiers in chariots. The walking army (infantry) can be seen following on behind the chariots. There is an Egyptian couple (perhaps farmers?) with a donkey (Equus africanus asinus), on the hill, to the right of the scene. This scene follows on from the previous ones, incorporating their colours & design elements. 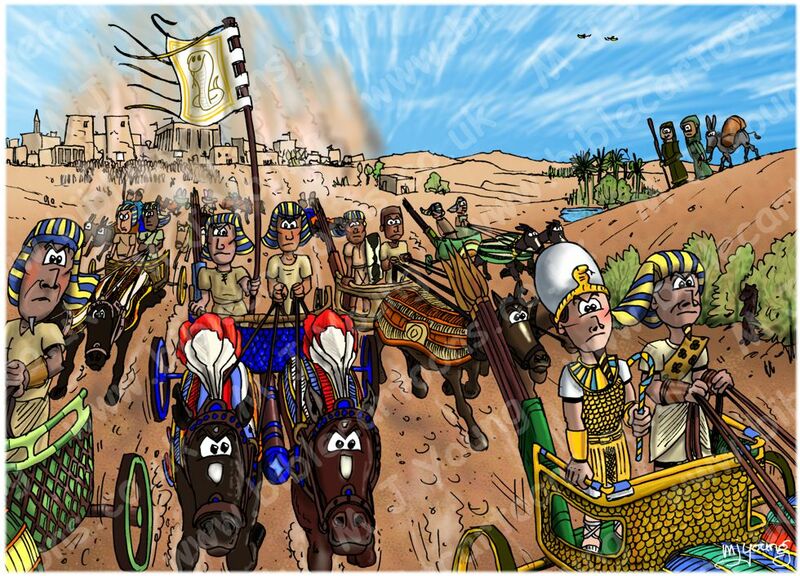 The charioteers are looking angry, as they have realised that they have let their Hebrew labour force leave Egypt! If you look carefully at the middle right of the picture, you will see an Egyptian mongoose (Herpestes ichneumon) standing on its hind legs, looking at Pharaoh’s chariot going past.